Please join us for a diverse provider panel on how to talk to our patients about firearm access, safety, and risk, followed by breakout sessions. 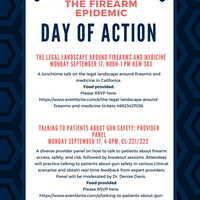 Attendees will practice talking to patients about gun safety in various clinical role plays and obtain real-time feedback from expert providers. Panel will be moderated by Dr. Denise Davis. Food provided.